And it’s not just the hosts that are a problem — they have accomplices! One reason so many people find bad hosts is because many large hosts have essentially bribed unethical website owners with large sums of money. Excessive-yet-meaningless expressions of gratitude (please, thank you, etc). Support tickets closed without resolution. Time-wasting initial replies informing you that somebody else will reply (because he/she doesn’t have the ability to actually do anything). Quite often, the actual ticket response will be many hours later, sometimes even days later. It’s almost not even necessary to point out the ridiculousness of those replies. The first host had a server down for 6+ hours, but seemed unaware of it — i.e., not monitoring their servers! The second host accidentally formatted the VPS node, and then feigned ignorance. Both utilize outsource support from cheap outsourcing services. Due to the shenanigans of affiliate marketers (and hosts that encourage them via high commissions), the web hosting marketplace is probably less trustworthy than a random person on eBay or Craigslist. At least the classifieds/auction seller is trying to sell you something, while the “review site” is just trying to con you for a $100 vig. Rather than advertise in the traditional sense, and allow consumers to weigh their options objectively, some hosts have instead spent their advertising budgets on the affiliate-driven sales model. Hordes of fake “top 10″ lists have sprung up online in response, created by unethical bloggers looking to make a quick buck. These spammy lists only suggest the companies that pay out the highest commissions, and the site only exists to generate commissions. These people don’t care about you, your site, or anything else. All they want are affiliate payout commissions. The host paid a spammer to leave fake positive feedback. The host paid their customers (in cash or credit) to leave positive feedback. The host paid a fake review site directly to receive guaranteed positive feedback. 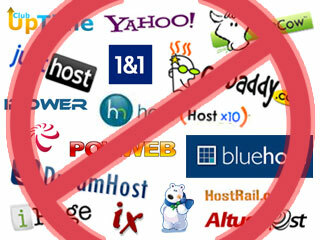 The review site removed negative reviews for hosts that pay higher commissions. Google search engine results pages (SERPs) are filled with these fake reviews and lists. An often-ignored aspect of fake lists is the power cycle that it creates. The fake “top 10″ host has essentially used its monopolistic-like economic power to drown out smaller competitors, preventing them from gaining more customers. Some of these large hosts can gain more customers in one day than smaller hosts do all year, because of the many fake lists all pointing their way. It’s almost as bad as the software patents that stifle competition and innovation. While it’s easy to blame the site owners (drug dealers), or even the customers (drug addicts), the hosts (drug suppliers) shoulder most of the blame. They know that they’re doing, and it happens in that wink-and-nod (“fair and balanced”) sort of fashion. The 3rd part of this three-part editorial series will discuss the practice of upsells, and the illusion of competition created by the multi-brand megahosts.